The Cardinals get their second straight victory in Tri-Valley Conference play. 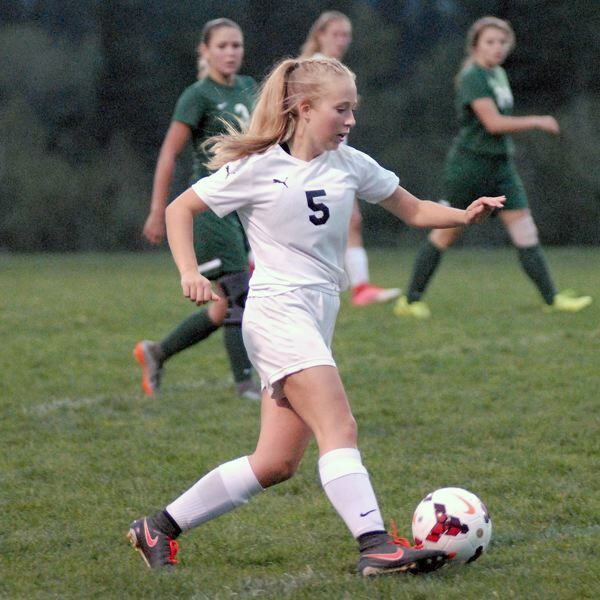 CORBETT — After not scoring a goal in the first three games of the season, it looks like the Corbett girls' soccer squad has found their stride under first-year head coach Denise Rosenblad. The Cardinals took down Estacada on Monday night by a score of 2-1. Margot Servais and Layel Parker each had goals for Corbett while Lissa Cauich had the lone score for the Rangers. While it has taken some getting used to, Roseblad is encouraged that her players are starting to pick up her system. "I'm a new coach here so we're building more into my style of play, which is more of a possession style rather than just banging the ball and chasing after it," Rosenblad said. "The more we build into that, the better we are going to get. I was happy with our effort tonight and happy with the way we are starting to play." Corbett would get a couple shots on goal in the opening minutes, but it was Estacada that would break the scoreless tie in the 10th minute of the contest. Estacada midfielder Hannah Hart hit Cauich with a great pass in the middle of traffic and Cauich was able to put it away to give the Rangers the 1-0 lead. "It was a great teamwork play with all the passes we did," Cauich said. "But when we came back after the goal, we kind have left our defenders on their own…We should have prevented that." And the Cardinals would make Estacada pay for the mistake. Just 18 seconds after the Cauich goal, Corbett forward Mallory McCowen found Servais making a run at the net and Servais put in a touch shot just over the keeper's head to tie the score at 1-1. Look for the full version in the Sept. 29 print edition.